IC 32-17-2-2 defines a quitclaim deed as one which "passes all the estate that the grantor . . . may convey." The requirements for lawful execution of quitclaim deeds are covered in IC 32-21-1, 2, 13; 32-21-2-3; 36-2-11-15. First, any document conveying ownership in real property must be in writing and be signed by the grantor or an authorized agent. Enter the names and addresses of all grantors and grantees. Be sure that all names in the quitclaim deed are the same throughout the document. For example, if the grantor is Jonathan X. Smith, but he signs it Johnny Smith, the recorder's office might reject the deed. Include the type and amount of consideration (often money). Provide a complete legal description of the property. All signatures must be original and notarized, and the signor's name must be typed or printed just below the signature. In the space at the end, the quitclaim deed should contain a return address (usually the grantee) to receive the recorded deed and future tax bills, and the preparer's name and social security number statement. *	IC 36-2-11-14 requires an endorsement by the county auditor before the document may be accepted for recordation. 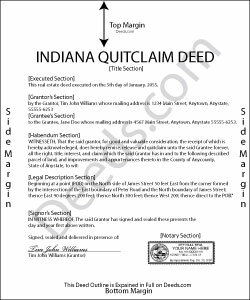 *	IC 36-2-11-16.5 states that the quitclaim deed must be printed on white paper (20 lb. minimum weight), no larger than legal size (8" x 14"); the sheets must not be attached or connected; the print must be typed or computer-generated in permanent black ink, minimum 10 point type; all pages must be printed with minimum " margins all around, except for the first and last pages, which must contain minimum 2" margins on the top and bottom, with " on the sides. Indiana follows a "race-notice" recording statute, discussed in IC 32-21-4-1. Quitclaim deeds must be recorded in the county where the real property is located. Upon acceptance by the county recorder, the instrument is stamped with the date and time of filing, and entered into the public record. This serves as constructive notice to interested parties and preserves the chain of title, making future conveyances of the land simpler. Stamping the time and date on the document allows it to be ranked in priority against additional claims on the same parcel. As explained in the statute, a recorded deed takes priority against future bona fide purchasers (buyer for value, usually money). For example, the grantor transfers ownership in the land to grantee A, who does not record the deed. The grantor then conveys the same land to grantee B, who does record the deed. By recording, grantee B moves up in priority and will, in many cases, retain ownership. In short, recording the quitclaim deed as soon as possible after execution is the best way to preserve the interests of all involved in the transaction. Janice W. said: Great instructions, samples, ease in getting the form I needed, filling it out as a PDF, and having it ready for a Notary's signature. I was hesitant a first, but glad I paid the fee - now it is done! Reply from Staff: Great to hear Janice! Thanks, have a great day!